Are the centre pairs (E/F) better for couples who want to chat on a 777? 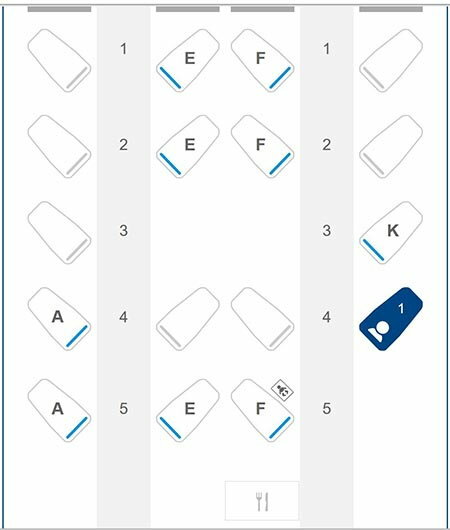 and is row 1 best, or is it too close to the galley/ toilets? My friend and I are booked on the BA 0197 London (LHR) to Houston (IAH) on 7th May, the 14:15 and I'm looking forward to it a lot! I've flown First once before to Las Vegas but that was from Gatwick and the experience was great at the airport but I'm looking forward to experiencing the Concord Lounge. It appears that it's the 777 which is a great aircraft but I'm torn as to which seat to choose, here's the actual availability right now..
2A and 3A would be my choices as the window blinds are a fun part of F, plus you can buddy dine/drink when you want to chat. You know, I was thinking exactly the same, I don't really want to be near the restrooms at the front and I seem to remember those two at the side being better for sleeping. That was on the old 747 stock though. Myself and the good Doctor (wife) are flying First (for the First time) to BOS next year, 777-200. She prefers window seats so I've taken 1A + 2A, but we have the pick of the whole cabin at the moment. Stick with what we have or better option? If you both want window seats, I'd say go for 2A and 3A. I've flown in 2A on the 777 and it's a great seat. I've never been in row 1 but BA crew have told me to avoid the first and last row in F on the 777 due to galley noise. Just booked flights from MIA-LHR -DEL for 4 of us in F, thinking 1A, 1K and 2A and 2K in he 747? What are your thoughts? I've flown 1A and 1K before but why don't seem to be available to pick at this time, is there a trick or time when they arereleased? Can't remember. BTW, our seats in F were actually $300 less than in J! I'm a happy camper. Are 1A and 1K already occupied? Also, 1A and 1K are for BA Golds and OW Emeralds only, until pretty close to the flight. Non-Golds/Emeralds on the same booking don't qualify. I don't think they are occupied as they are unavailable in all 3 different flights I booked on the 747, one of the flights just went on sale today, which makes me think they are blocked. All 4 of us are OWE through AA but maybe that's not transfering to BA, will call them tomorrow to find out. I'm getting this seat map for a 777 flight in first class. Row 5 shouldn't exist. Any ideas if this is just a glitch, potential upcoming equipment swap, something else? Did spend quite a bit of time searching but couldn't find anything like this. 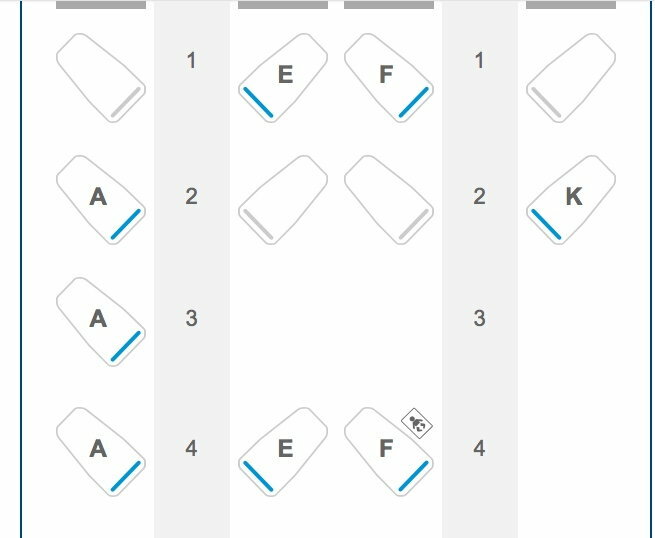 I'm booked on an overnight from PHL - LHR on this cabin layout and wondered which was the best seat for a solo traveller? Any experiences? We have 3 aircraft with this configuration, here is the seat map. I would take 4K then 3K. Thanks. I was thinking 4K might be nosier if there is a screaming child in row 5, but I guess I could take my chances and there's a possibility that there won't be one. In 4K there's noone behind you is there? No one, actually I’m now thinking 3K as the dutyfree bar area is behind 4K. They've currently allocated me 1A. Despite the possibility of being disturbed by galley or toilets, the crew will be mindful that it's a night flight. I'm not a great sleeper on overnight departures from the East Coast anyway. Looking for advice on the Row 1 GCH restriction. My self and the good Dr are booked together in F IAD -> LHR on a 747. 1A and 1K are available, as a GCH I can select either but the good Dr is a lowly Blue and as such cannot. Sadly row 2 is also taken. I was told that at T-72 row 1 should open up to non GCH, my thinking therefore is to nab 1A for myself now, and hope that at T-72 1K is still available. It's an overnight so doesn't matter quite as much. Your plan sounds fine as long as the other seat is an A or K. Wouldn't be surprised if the folks in Row 2 are going to try to pounce on 1A and 1K themselves. If you really really want to sit side by side, I'd do the middle pairs.